A super duper handmadebyhells.com Gift Voucher to purchase and send to a friend (or maybe just keep it for yourself after all)!! 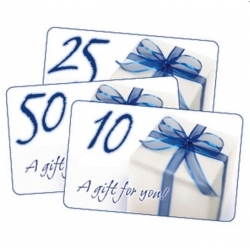 Choose from Voucher Values of £10, £15, £20, £25, £30 or £50. Simply select from drop down box. *NOTE: When you purchase a gift certificate, A voucher code will be emailed to you after admin has confirmed your payment. You can then email this directly to your chosen recipient or print it out/cut and paste it onto a paper of your choice, for the recipient to redeem online. When gift certificates are purchased on their own, there is no p&p charge as the voucher details are issued via email). If you order other products at the same time, our normal p&p rates apply.